Isis is the goddess of fire. She is a beautiful goddess. She has long hair made of fire. 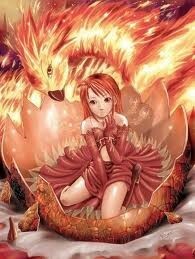 She is almost entirely made out of fire. Isis used to be just a normal nymph. One day her house caught on fire and they thought that everyone was out, but Isis was trapped and died in the fire. Her sister found her body in all the ash. Just as she ran to tell her mom Isis was lifted into the air by the god Zeus god of all gods and goddess. ‘’ I shall bring her back to life, but she will now be the goddess of fire,’’ boomed Zeus. Then she gently floated back down with fire as hair. She was wearing a brown dress that went down to her knees. Her eyes were redder than the fire. ‘’I’m alive!’’ Isis yelled. ‘’Yes, but you will now be the goddess of fire for the rest of your life,’’ Echoed Zeus. She looked around in all the ashes and flames.’’My home!’’She cried. You will come live in the clouds from now on,’’ Boomed Zeus.’’Ok,’’ Isis mumbled. She said goodbye to her family, and followed Zeus up to the clouds. When they got there he showed Isis around. She met a goddess named Aquamarine. She is super duper nice. They started to hang out together, and sometimes they would get in trouble. Isis is still living up in the clouds. She still has fun.